Having recently watched some videos on YouTube of previous year’s editions of the race and reading the magazine I collected with my number. I knew it would be tough 74Km with 4350 metres of total elevation gain with another 4057 metres of descending with Rocky uneven terrain to contend with. I caught the 3.30am bus with all the other runners from my where I was staying in to the start located in Fuencaliente. We arrived just over an hour before the 6.00am start. I stepped out of the bus into the dark windy environment. After getting the toilet and bag drop out of the way I realized that I’d forgotten to fill up my Camelbak. There weren’t any taps or anyone handing out water. My solution: finding a couple of half-bottles of water that other runners had discarded and topping up with them. Then it was the short walk down to the start. It was cool seeing a few familiar pro faces at the front – Ida Nilsson (1st woman last year) and Zaid Eit Malek (3rd man last year). I waited at the side until a few minutes before 06.00 sneaking through the barrier near the front of the huge pack. There was music pumping and the announcer was getting everyone juiced for the off. I very nearly forgot to set my GPS watch in time (started the satellite search 2 minutes before the gun and luckily the satellites were located with about 30 seconds to spare). The gun went and we made our way up past the lighthouse and along the road. Fireworks went off which personally I found a loud distraction more than anything. A bit further along we made our way from the wide road onto a narrow trail. It was a bit of a bottleneck and I was glad to be near the front away from the worst of the crowds. As the trail led upwards it was an awesome sight to look back down and see thousands of headaches snaking their way up. 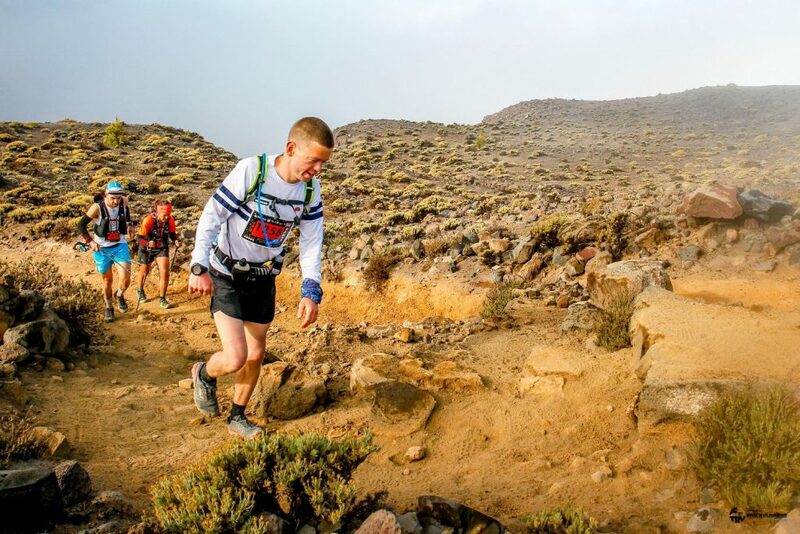 The first feed station was in the small town of Los Canarios where the main street was lined with locals cheering on the runners – a real treat so early on. The headtorch came off at the top of the street as daylight beaconed and made my way into the trees and where the real climbing begun. It was ridiculous – steep ascending up sandy/gritty/loose/dusty material made progress painfully slow and was both mentally and physically draining. Thankfully the weather was pretty ideal at this time – cool and sunny and the stunning views/surroundings really helped keep morale up. After the initial pig of a climb I knew there would be a bit of descending before the push to Roque de Los Muchachos (the highest point of the course and the island). It wasn’t too long before reaching the end of the half marathon/start of the marathon course (the half was the first 21km of the Ultra course and the Marathon started here and finished 5km before the end of the Ultra). I passed the half marathon point in 2hours 3 minutes. After this there was a nice easy gently undulating mud/track which offered a chance for the legs to recover a little before the push to Roque. Near the start of the climb we went through a forested section – it was damp and cold in places with the dew blowing off the trees and wind-chill. I was glad I’d opted for my white long-sleeved Ellesse t-shirt (a TK Maxx special purchased a few weeks beforehand) as this along with my Bramley buff kept me warm. Fairly early on during the climb the leader of the marathon came flying past at some serious pace – he had a substantial lead at what must have been about 15km in. The next 30-45 minutes I felt good – I’d gone through 23.5 miles (over halfway) in 5hrs 15mins. My initial aim was to try and finish in under 11 hours, possibly even a sub-10 of things went well, so I was thinking it was potentially game on for the sub-10 with far more downhill than up remaining. As I climbed higher and the runners thinned out I utilized the opportunity to have a pee whilst running (a time-saving tactic used by Dean Karnazes in his Ultramarathon Man book). This went well with no hesitation and minimal spillage. The heat started to intensify and altitude kicked in above 2000m and things got very hard at the highest points. The views were incredible and I could see Mount Teide/Tenerife above the clouds in the distance. Just when I thought I’d reached Roque there would be another little descent and another little climb. Eventually I saw the big white marquee marking the aid station at Roque and this couldn’t come soon enough. I’d gone through all three of my energy bars and was in urgent need of refueling. Entering the marquee there were several tables full of choice. I necked a few cups of water and must have had 5 or 6 chunks of watermelon to help rehydrate. Food wise I opted for a couple of cereal bars and raisins. Both hit the spot well and I took some raisins in my empty jelly-baby containers with me. After some iso drink, more watermelon, re-filling the Camelbak and getting water poured over my head I pushed on feeling significantly more refreshed. The altitude and heat were still testing but I placed myself conservatively and felt good enough. A little way down the dusty Rocky track the heat really intensified and I pulled my rolled-up long sleeves back down to avoid burning. I was now descending at a not-much quicker than walking pace and was constantly having to move aside to let faster runners past. I kept drinking at least every 5 minutes. There were a few occasions when I stepped aside to pee but nothing came out. I knew this was now survival mode – go slowly, keep drinking, concentrate and make it down safely. There was an aid station maybe halfway down – again badly needed. I discovered after rummaging around/spreading cereal bars everywhere that they didn’t have any of the chocolate ones they had at the top so had to make do with apricot. So after a cereal bar, more raisins, iso drink, watermelon and water on the head I pushed on. Thankfully it wasn’t too long until I came into familiar territory at Mirador El Time where I’d come to watch the Vertical Kilometer race on Thursday. At this point I was grateful to be back on concrete/tarmac for a bit albeit very steep downhill stuff. 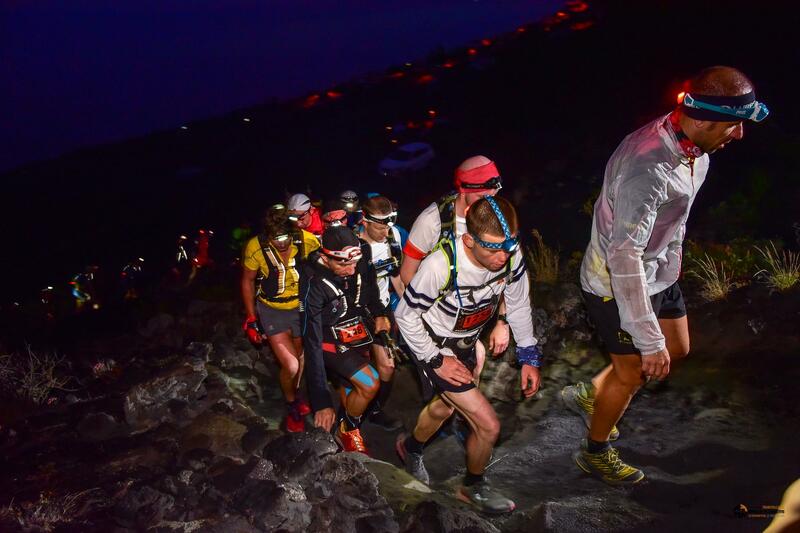 I had a quick glance at the watch (I was just over 10 hours in with 12-13km to go) and thought any chance of a sub-11 had gone with a tough descent and final climb still to come. However things weren’t as bad as I was fearing with a decent distance covered with tarmac followed by the final track down to the beach in Tazacorte being solid (no loose Rocky crap) which made it mostly slowly runnable. 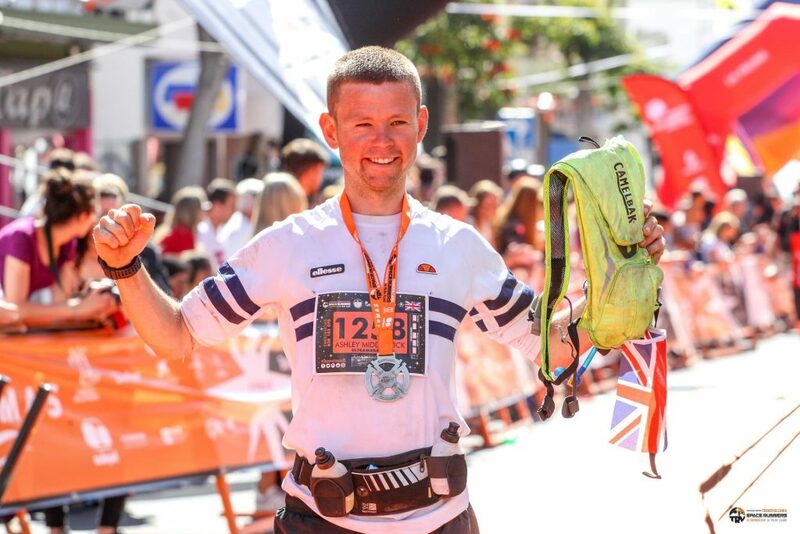 I made it down to Tazacorte with 10hrs 25mins on the clock with only the final 5km climb to go – the game for the sub-11 was well and truly back on. I didn’t stop at the water station grabbing some a bottle of Gatorade and cup of water as I ran. The route went down onto the beach briefly which I wasn’t expecting before looping under the road and following a dried-up river upstream. This was pretty tough but I was in the zone and it felt great to be overtaking runners rather than being the one overtaken. After the dry river the course went up some very steep cobbly tracks/tarmac and knew I’d have to keep the intensity up to get in under 11. My Camelbak had now run dry and I was thankful for the bottle of water that I hadn’t yet touched on my running belt. This came into play in the last 2km and poured some over my head as well as drinking some. Finally the hills stopped and it was a long straight road about 1km long to the finish and I could see the finish arches in the distance. Another glance at the watch: 10 hours 54 minutes – this should be in the bag. I ran this last stretch with a big smile on my face high-fiving the locals cheering me on. I had to keep a decent pace going and there was a slight doubt towards the very end causing a relative sprint. Then the clock came into view and I knew I’d done it. A few last high-fives before crossing the line in Just over 10 hours 59 minutes. Job done 🙂 . 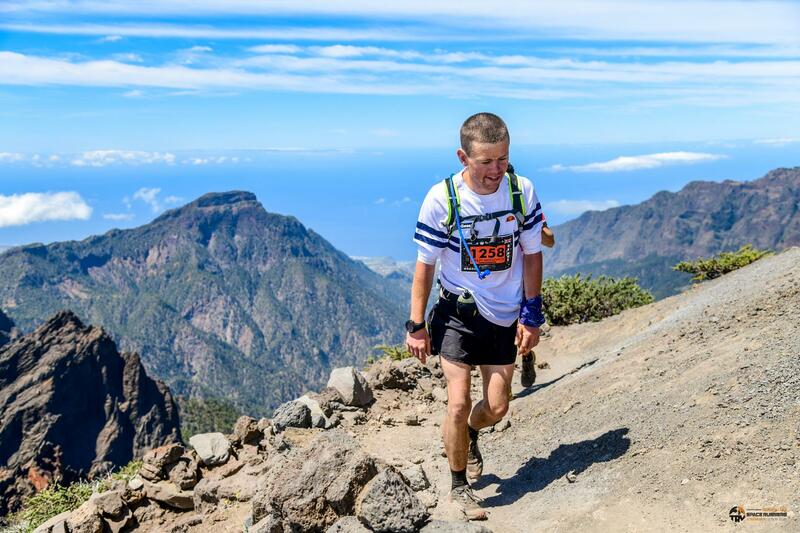 I’d give Transvulcania a solid 8/10 rating. The support, scenery and aid stations were all superb and were generally well organized. Good choice of help-yourself food at the end too which I took full advantage of. Good free buses too. They could have improved the signage in a few places – generally I was OK as was just following the person ahead but there were a couple of uncertain moments when I was in my own. Also there was a lack of toilets at the end and those few that were there lacked paper causing me to have to sneak into a restaurant. The medal was nice but lacked the year and distance on it. Overall not as good as The Maraton del Meridiano in my personal opinion, but superb none the less. Definitely one off the Ultra bucket list!!! 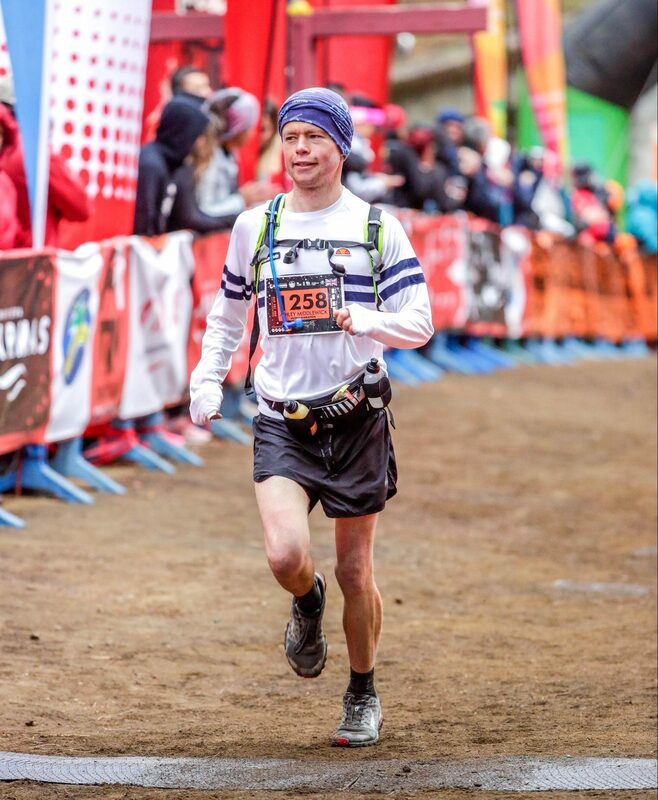 Posted in April-June 18, Race Reports, Roadrunners18.